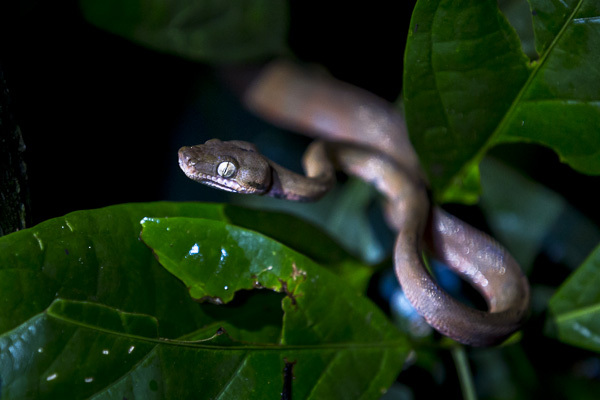 I photographed this beautiful juvenile tree boa while on a night walk through the Amazon jungle in southeastern Peru. The Amazon jungle has always inhabited a special place in my imagination. Mysterious, faraway, full of ominous and beautiful creatures, it seemed out of the range of possibility to actually experience it. Which is why it was all the more extraordinary to find myself motoring up the Tambopata River–a tributary of the Amazon river in southeastern Peru–on a small wooden boat heading into the Amazon basin for four days earlier this week. The air engulfed me like a hot, wet blanket when I first walked out of the airport in the Amazonian town of Puerto Maldonado and I was surprised to see how sunny it was given that this time of year it can rain for days without stopping. My second surprise came a few hours into our boat ride when we came upon a small creature swimming across the river. At first I thought it was just another log like the many we’d passed close to shore and then I saw it had eyes, a mouth and a very determined expression. Our guide, Jair Mariche, excitedly exclaimed it was a three-toed sloth and told us that in all his years of guiding, he’d only seen a sloth once and certainly not one swimming. 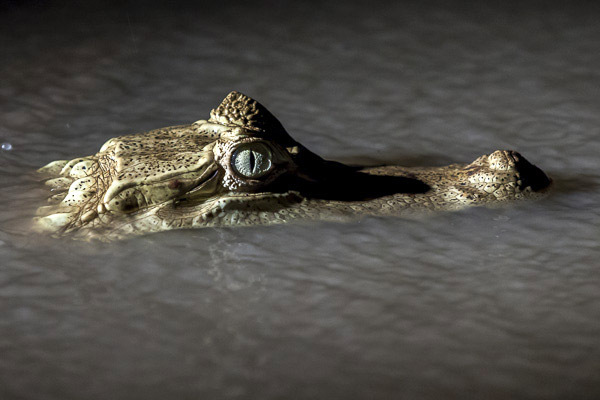 This was only the first of a series of extremely lucky sightings we had during our four days of exploring the Amazon. The days that followed were full of extraordinary (and very muddy and sometimes wet) adventures during which we saw numerous snakes, spiders (including a family of tarantulas), wild pigs, giant river otters, monkeys, macaws, an electric eel, a wide variety of frogs, extraordinary selection of insects and birds and of course, vegetation that grows on a scale I struggled to wrap my mind around. At the end of each day, I was struck by how much my fantasy of the Amazon felt accurate. I couldn’t seem to get enough of the fact that the wildlife in the Amazon operates independently of human existence, that each creature seems to have found a unique niche to inhabit and thrive in and that all the Amazon’s creatures represent endless adaptations that have allowed them to survive in their complex and competitive world. A rainstorm looms in the distance as we motor up the Tambopata River in a narrow wooden boat into the Amazon basin. A three-toed sloth swims across the Tambopata River. Despite the fact that they move very slowly in trees, the three-toed sloths are surprisingly agile swimmers. 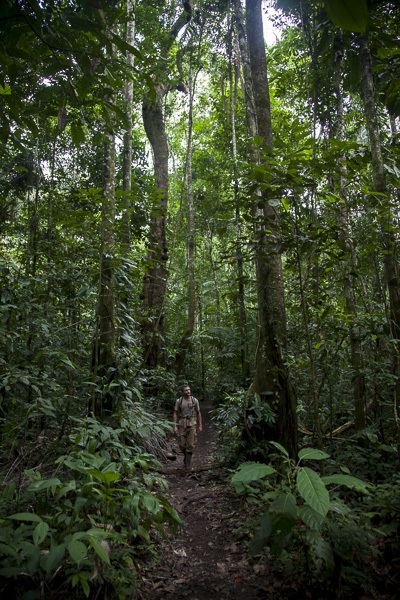 Trees in the Amazon compete for light and there are, as result, a lot of extremely tall trees. Some trees reach heights of over 420 feet! 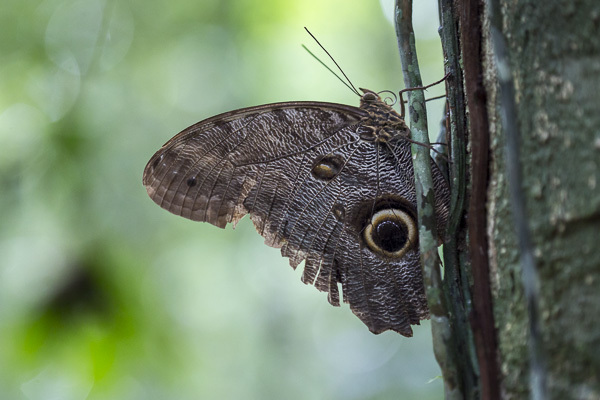 An owl butterfly--known for the large eye-spot patterns on its wings that resemble owl eyes--rests on a tree. 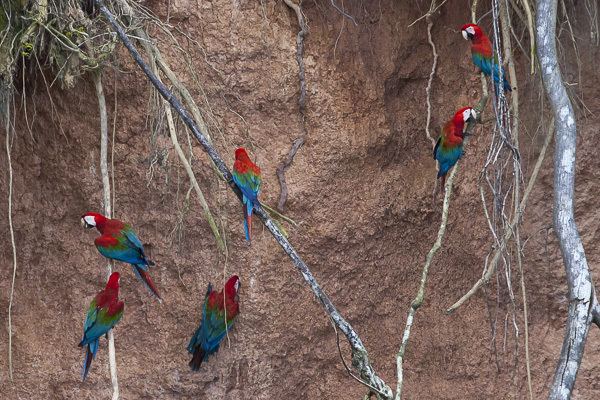 Red and green macaws gather on a clay lick along the Tambopata river. There are numerous theories as to why the birds consume the clay on an almost daily basis in the Amazon. One theory is that some foods eaten by macaws in the wild contain toxic substances which the clay they eat neutralizes. 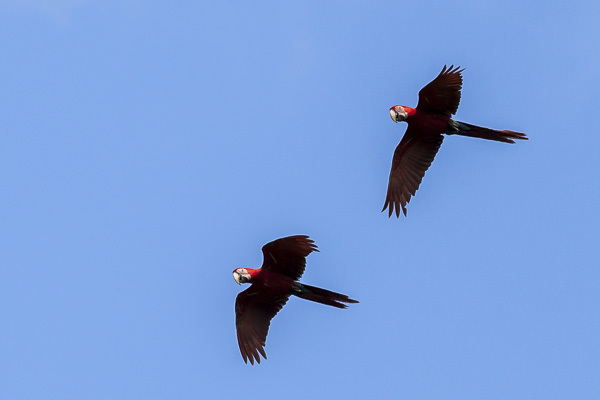 A pair of scarlet macaws fly off after visiting a clay lick. Macaws mate for life and are almost always seen flying with their mated pair. 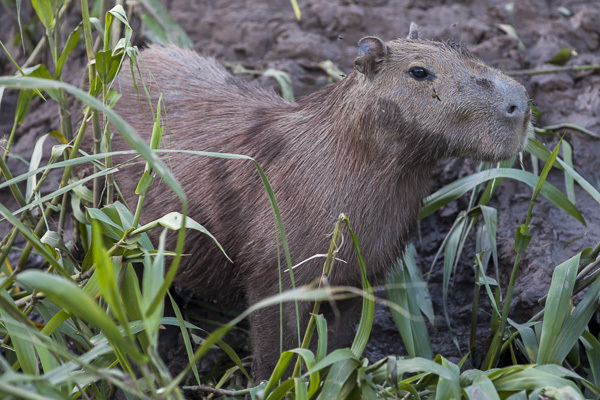 A capybara, the largest rodent in the world, forages for food on the banks of the Tambopata River. The rodent, which is related to the guinea pig, hangs out in groups of 20 or more animals. While it isn't endangered, the capybara is hunted for its meat, its hide and also for a grease from its thick fatty skin which is used in the pharmaceutical industry. I photographed this three hundred year-old giant strangler fig deep in the jungle surrounded by other very tall trees such as a 600 year-old kapok tree. 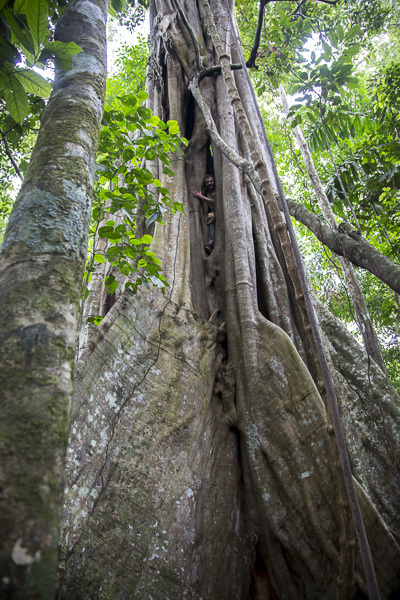 The strangler fig has developed an adaptation that helps it survive by growing seedlings in the crevices of other trees. The roots of these seedlings then grow downward and envelop the host tree while also growing upward to reach into the sunlight zone above the canopy. The host tree dies over many years and becomes hollow (and as result one can sometimes climb up its center as you'll see in this photo if you look closely!). 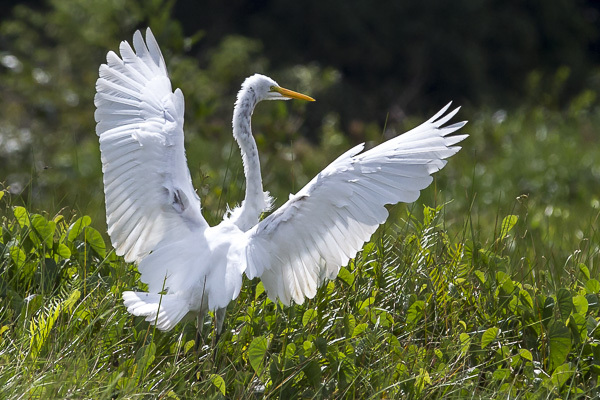 A great egret lands on the banks of Condenado Lake. An electric eels hunts for food in Condenado lake. 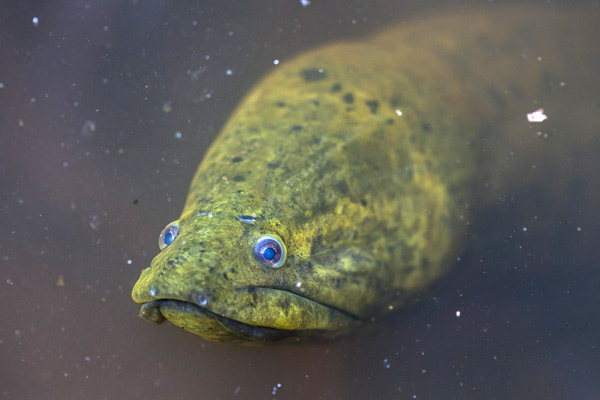 Apparently this eel is capable of generating electric shocks of up to 860 volts! It uses this unusual adaptation for hunting, self-defense and for communicating with fellow eels. Despite its name, it is not actually an eel, but rather a knifefish. products such as bags, shoes etc. 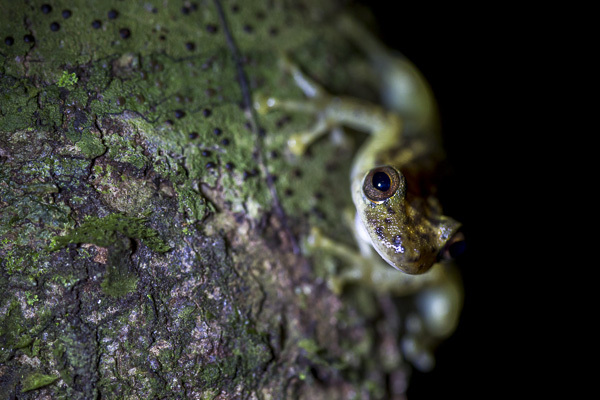 An emerald frog clings to a tree, waiting for prey to come his way. 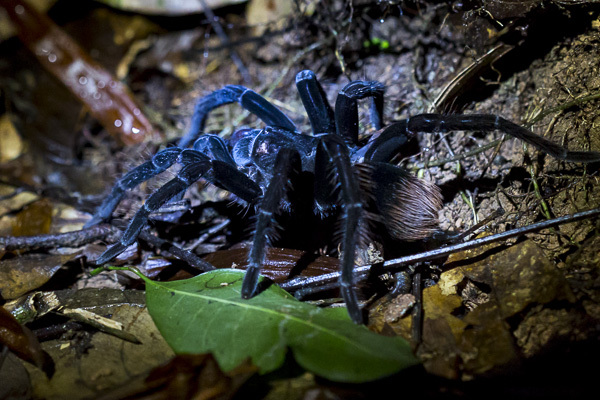 “chicken spider” comes from the fact that these creatures have been known to eat chickens!